Here at TeamSnap, big changes are happening. We are revamping our registration process for clubs and leagues! In fact, we think that our new registration flow is the easiest out there to use. But that’s just our opinion. Everything you need for TeamSnap registration is online. It is the 21st century, after all. If you’re collecting money, that means no checks, no visits to the bank and no hours wasted with on-site registration. In addition, you can use our online tools to collect any player or parent information you need as well as waivers and documents. “Easy” doesn’t even begin to describe it. Plus, our new registration flow is going to turn heads. It’s modern, streamlined and so pleasant to use that folks might actually ask for more registration documents. Ultimately, though, we’ll let the product do the talking. Take a look, and for more info, schedule a demo with one of our league specialists. 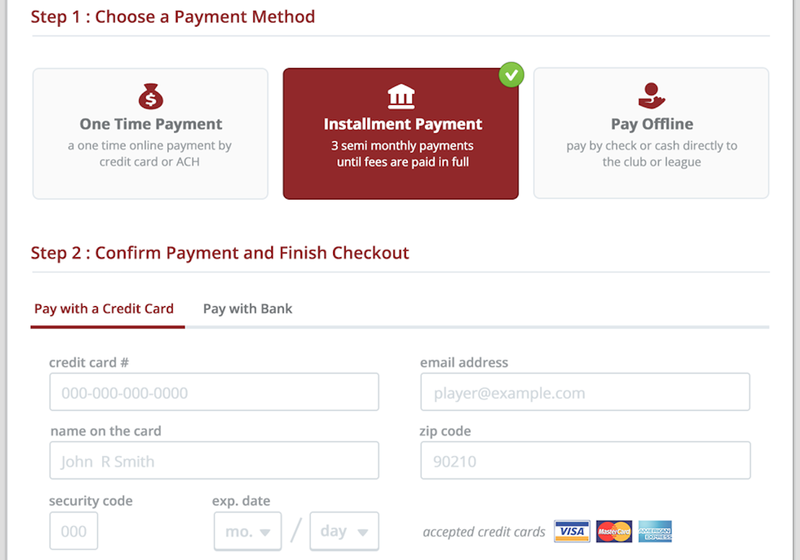 One of our most talked-about new features is installment payments, which allow your administrators and registrars to break registration fees into smaller payments. What does that mean to you? Let’s say that your daughter is playing soccer for a TeamSnap club this season and owes $5,000. Thanks to installment payments, the club can offer an up-front deposit of $1,000 and divide the remaining $4,000 into four $1,000 monthly payments. Admins and registrars are happy because they don’t have to chase parents down for money. Parents are happy because installment payments are less of a financial burden for the family. And TeamSnap is happy because everyone is happy. What is player-specific registration, you ask? Let’s say you’re accepting registration for three different levels: U8, U10 and U12, all of which have different prices for registration. You can set it up so that players registering for U8 will only see U8 prices when they go to register, U10 registrants will only see U10 prices and U12 will only see U12. This feature ensures that everyone pays the right amount at registration and eliminates the hassle of adjustments and corrections. And then everyone jumps for joy. We’re thrilled to offer these innovations to our customers! And if you’re wondering if the Leagues & Clubs solution is right for you, get a demo today! Carrie Devkar is TeamSnap’s director of club & league marketing. When she’s not working on TeamSnap’s Club & League solution, you can find her spending time with her son and husband, reading and indulging in low-brow desserts.